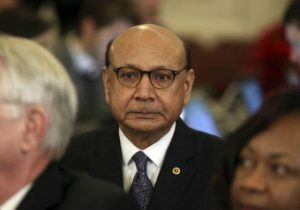 Gold Star father Khizr Khan, who gained national prominence criticizing Donald Trump's proposed Muslim ban at the 2016 Democratic National Convention, recently told a reporter that he was not blocked from attending an event in Canada as he had claimed earlier. Khan's son, Army Capt. Humayun Khan, was killed in 2004 during the Iraq War. Khizr Khan later become known nationwide after he denounced then-candidate Trump in his July speech at the DNC, leading both men to get into a public feud. After the election, Toronto-based RamsayTalks scheduled a March 7 luncheon on tolerance starring Khan. But in a Facebook post one day before the event, the group announced that his speech had been cancelled because Khan was "notified that his travel privileges are being reviewed." "This turn of events is not just of deep concern to me but to all my fellow Americans who cherish our freedom to travel abroad. I have not been given any reason as to why," wrote Khan, in an attached statement. Details about who blocked Khan's trip and was reviewing his "travel privileges" were vague, and reporters were immediately skeptical. As a naturalized U.S. citizen who has not been charged with a crime, there should be no legal barrier to Khan traveling outside the country. U.S. citizens also do not need visas to enter Canada, and the Canadian Foreign Ministry denied issuing a review of Khan's ability to travel there, the Washington Post reported. Khan's native Pakistan is not one of the countries affected by President Trump's order limiting travel from six Muslim-majority countries over terrorism concerns. Khan changed his story of what happened last week. In a March 17 email to a Richmond, Va. radio station, Khan said that it was his own decision not to travel abroad. "I did not want to go through the hassle of uncertain rules and capricious implementation," Khan told WCVE's Hawes Spencer. Khan also said he is concerned about Muslims being profiled at the border.